Although goldens are sweet and loyal and make excellent pets, many people focus on the looks and status of a golden without thinking about the commitment that they will need. Goldens are smart, witty, and perpetual puppies. If you don’t do your homework before deciding to bring a golden in to your home, you could be in for quite a surprise. Golden puppies are probably the cutest thing on the planet, but people choosing to get a golden pup need to keep in mind that they will soon have a dog that is 65 to 90 pounds. They are still adorable then they grow up, but if the novelty wears off while they are still young, they can become ignored in their own home. As time goes on and the “puppy” gets bigger, it is imperative goldens attend an obedience class or two and that what is learned is reinforced at home. You’ll need to get used to tumbleweeds of dog hair, clogged vacuum cleaners and lint rollers in every room. Your favorite pair of black velvet pants will look like a muppet faster than you can imagine. Dog hair is something that you will have to deal with on an hourly basis if you bring one into your home. Worth it? Absolutely. No, we’re not kidding. They are smart and need to go to a structured, positive-reinforcement obedience class immediately. Those goldens you see on TV? Years of training, time and effort. If you put in the time up front, you will be rewarded for years to come. Exercise is key with golden ownership. They are active, playful dogs that like to be social. Not getting to go for walks at least every day will mean that the golden will need to find something else to do… and that something might involve chewing on items or furniture that they shouldn’t. Plenty of exercise will help your golden remain well adjusted and fit, as well as keep them out of trouble. Not every person gets along with everyone they meet, so why should we expect that of our dogs? Contrary to popular belief, although many goldens are great with kids, big and small, not all of them enjoy the company of children. Many have had bad experiences with children whose parents were not watching them, and many have just never been socialized with them. Getting a golden does not mean that they will automatically let your kids crawl all over them. Keep in mind that goldens are dogs, and all dogs can snap or bite. There are 4.7 million Americans who get bitten by dogs every year. Surprised? Any breed of dog can bite at any time… and that includes goldens. There are many ways to prevent dog bites. Visit the American Veterinary Medical Association website to learn more about preventing dog bites. 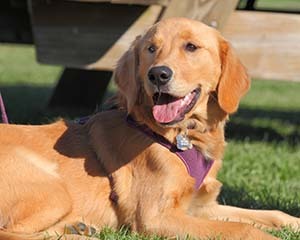 We recommend you visit the Golden Retriever Club of America’s website to learn more about the health issues pertaining to goldens. As Good as Gold believes in a holistic approach to dog food. Many advertised dog foods that look great on TV have additives, sugar, preservatives, corn, grains, and sometimes even sawdust in the ingredients. Less is more. Look for labels with fewer ingredients, and make sure that the first two ingredients aren’t corn and wheat, since many goldens are allergic to either or both of those ingredients. LostPetUSA.net has the essential tools to help reunite lost and found pets with their families. Click here for this free online and mobile service that includes a searchable, nationwide registry of lost and found pets.